I've had a lot of conversations lately about living gluten free. I'm not sure why, for me, June seemed to be all about gluten free living month. But it was. And actually, it was a great reminder of why I strive to keep those pesky glutens out of my diet. I have had stomach issues for as long as I can remember. Truly. It goes back to my very early elementary (pronounced: el-ah-men-tary) school days. I had test after test done to me as a kid. GI's out the wazu! And in the end, the conclusion was that I had psychological issues and ulcers due to my tumultuous childhood. Read: an over sensitive tummy due to stress. Which is probably a decent assumption. However, now that I am older and dare I say, a smidge wiser, I can reflect on the bigger picture. And while I do believe that my cruddy circumstances played a major roll in things, I also strongly believe that I have always been gluten intolerant. I think the combination made for a perpetually unhappy belly. But you know, when you grow up with your strongest instincts being to ignore and cover up, the whole belly ache business gets pushed to the side. Until one of my Butler Besties was diagnosed with celiac some six or more years ago, I'd never heard of such a thing. But I was curious. What was my food loving friend going to eat for the rest of her life without the option of a sandwich or pasta or pizza? I read a lot about the subject. Like way more than a normal person without the disease would ever admit to reading. I read cookbooks and cooking blogs that catered to the gluten free and casein free peeps. But back then, I was just reading out of curiosity. I mean, I read cookbooks the way normal people read novels. Cover to cover, over and over again. So I thought I was just curious about food. Fast forward about five years when I started to suspect that perhaps my issues might have an actual physical connection to food. It certainly wasn't a singular, light bulb moment. More so over time, I began to put the pieces together. And that's when my journey slowly began. You should note that I do not test positive for celiac disease. I am considered gluten intolerant. Whatever. I am 1.) not convinced the testing is all that reliable and 2.) completely uninterested in titles. I know that I feel considerably better when I consistently avoid gluten. Period. I am also not perfect. (Y'all must be shocked!) I have had whole weeks of slips. And ooops nibbles of yummy treats. Several slices of pizza were happily consumed over the last few months. And then there is my stance on pie. I've made gluten free pie crust and it's pretty good. But apple pie- a two crust pie- is sacred in the casa de crocodile. Seeing as how I make this heavenly treat so infrequently, that is my one self-approved gluten full food. Until I can re-create an identical GF pie crust, my two crust pies (which is really only ever apple) will remain gluten full. Oh and why not one crust pies (such as pumpkin or custard)? For whatever reason a bottom crust being GF bothers me not. There are also hidden glutens everywhere. The minute I forget to read a label, those pesky buggers appear. I recently bought a pack of Twizzlers to eat on a plan ride. But never needed them. So I tore open that pack the other day while reading emails. And about four candies in, I finally thought to read the back ingredient label. Guess what contains gluten? Sad sad day for me. I try not to sweat the small stuff though. When I make a mistake, I just learn from it and move forward. I am very blessed that I am not allergic to gluten. So no constant clutching to an epipen and fear of anaphylactic shock my end. Thankfully! I have the luxury to make mistakes or take an occasional quick taste and not have major, immediate side effects. But it's worth it. The more steadfast I remain on a gluten free diet, the less my belly aches. The less I itch and twitch. And the more I feel like myself. But I also get asked quite frequently if a gluten free diet is good for weight loss. And honestly, that is just sort of silly. One can eat just as many calories and grams of fat on a gluten free, dairy free or meat free diet as they can on an eat everything without major restrictions diet. So no, it's not a weight loss plan. At all. When I use the word diet, I do not mean anything akin to a temporary food limitation plan such as Atkins, Dukan or South Beach. It's a permanent lifestyle in an effort to not feel super sick all the time. It is however sort of a pain at times. Take for example an experience I recently had with several girlfriends at a cute bistro. The waiter had no idea what gluten was, bless his sweet heart. And the chef spoke very little English. They told us a particular dish was GF but when it arrived, it was clear that it was not. It took days to order. At one point the waiter asked us if ice cream contained gluten. This was at the end of a very long meal. I am pretty certain he still has no idea what we were talking about. He was cute though and really trying very hard to help my little gaggle of high maintenance girls. Next up ... I will list some gluten free favorites. The pre-packaged products are actually getting much better and becoming more accessible. While I don't eat many of them, I do have several that I swear are nearly as good as their gluten full counterparts. 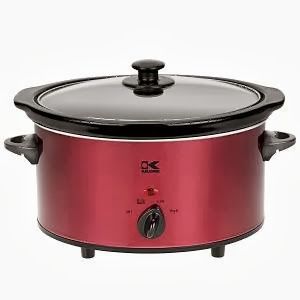 OK so I try not to post too many coupon deals on this blog but this is just too good to keep to myself. I mean, toilet paper is a universal need, right? Are you signed up to receive emails from Staples? If not, you should. They don't send them out very often but they almost always contain a great coupon. If you are already signed up, check your inbox. I received a $5 Staples coupon yesterday. Charmin Basic 16 double roll pack is on sale for $4.99 this week at Staples (I never thought I would ever go to an office store for more than paperclips either.). Use the $5 Staples coupon to get it for FREE. Actually, better than FREE. I didn't even have to pay tax and instead they handed me a $0.01 (yes, as in one penny!) coupon. How funny is that?! I am not sure if you will get the coupon if you sign up now but it's certainly worth a try. And if not, you will be on schedule to get all the other future offers. Walking the dog last night, I ran into a neighbor and another fellow dog owner in the park. After the dog owner and his dog, Reiley, left, the neighbor asked me his name. To which I replied, "Reiley's dad." She was a bit thrown off but I explained that dog owners, while super friendly, rarely know each other's names. Everyone is the dog's momma or daddy. I'm not sure I had her convinced that this was normal. So tell me fellow puppy mommas, do you do this too? Do you know everyone in town who has a dog, but only by the dog's name? I seriously have very dear walk the dog friends with whom I've been friends for years but have no clue what to call them. It's all, "Heyyyy Fluffy's Momma!" And it seems like it's just way beyond the point of acceptable behavior to introduce myself to someone I've been talking to for four years, right? I spent last week in Indianapolis with my besties from college. And it was amazing! Oh sure, they are all married, living in fun homes and most have precious babes. But when the four of us are together, time stands still. Nothing, in regards to our personalities and chemistry, has changed. I was the best kind of weepy all week as I realized that sometimes it's totally OK to go home again. To reminisce. To bask in the sunlight of our glory days. To walk around campus and giggle at all the silly things we did. Oh I am just so glad that I went back to visit with my Indy crew. The four of us are all so different. It's a bit of a wonder that we found ourselves bonded so tightly for nearly 15 years (gulp...time flies when you get old!). But when we're together, we balance each other. We bring out the best in one another. I love being able to reflect back on our relationship, as now I can see how well we all just work into each other's lives. I like living here in the North Pole. I do. Especially now. Summer here is breathtaking. But I've not managed to gather a group of best friends as I have in several other cities. And I miss it dearly. It was just so good for my soul to have an entire week to laugh until it hurt with my best girls. To love on their little ones. To hug people who love me for my quirks, not despite them. Those Butler Besties filled me up again. I feel much more me after all of my trips to see friends this month. Having to fly in for a play date with a best friend is completely unideal. And I am possibly reaching the end of my rope living so far from a core group. But for now, I feel refreshed. And reminded that I am a very lucky little girl to have so many amazing women in my life! A sort of dizzy world. So remember two years ago when I got contacts? Yes well, I neglected to fill you in on how that all panned out. I lasted exactly two days. And gave up. I am just not OK with sticking my finger in my eye. At all. I really really want to be OK with it. OMG it would make walking the dog on rainy or snowy (those two alone comprise about 70% of the weather up here) days. But well...I'm just a big baby I guess. So I wear glasses. You should know that I do actually like wearing glasses. I just think it would make certain activities easier if I had the option to also wear contacts on occasion. But seeing as how I am not there yet, I figured it was high time to order a new pair. Or two. Both with the sunglasses lens attachment because I am totally getting wrinkles between my eyebrows from squinting in the sun. Unacceptable! The odd thing is that I never ordered new glasses with my new prescription two years ago. I meant to. I looked at them multiple times. It just never happened. So I have been wearing my old glasses. And having to squint to see things in the distance. Which is totally awesome and looks stunning, by the way. I finally got around to ordering them before I went away and they arrived today. So cute, in my humble opinion! Very different from what I've been wearing for years now. And while the script is only slightly stronger than what I've been wearing, getting used to them tonight has been sort of exhausting. Giving me a little headache actually. I'm sure by tomorrow it will all be fine. But at the moment, my world is taking a smidge of adjusting. And before you bother, yes I know I need to go get an updated eye exam. I'm on it for the fall. But it takes me months to work up the nerve. I need to plan that out waaaay in advance. Why, you wonder? The air puff in the eye! It seriously takes me months of deep breathing to drag myself, big bucket of trembling nerves and all, into that room. Also, I read of this company about three years ago on a blog that is no longer. But I wrote the website down with the intention of ordering a few fun specs at a fraction of the price. I have to say, I am thrilled. And don't feel the least bit guilty buying two pairs to wear for a few months until I go get a newer prescription. I highly recommend them! Seriously- just look at the prices. Crazy fun, right?! 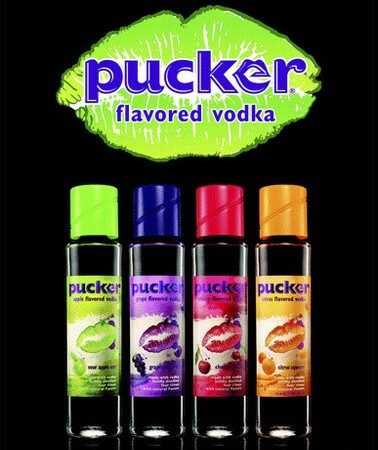 I've seen a few ads for this new vodka by Pucker and the only thing it reminds me of is a college fraternity party. And while I am well beyond my classic around the world, Dancing Queen, all night, act a fool, frat party days, I sort of really want to taste all of these. I won't though. Because I am old and responsible and more than one glass of wine gets me tipsy. But you have to admit...they look super fun. Click HERE to request a FREE year subscription to Martha Stewart Living. You just fill out your information and take a short, 5 minute survey. This is how I get nearly all of my magazine subscriptions. I rarely pay a penny for magazines as they are always eventually available for FREE (my favorite price!). 2 kinds of blueberry jam with apple onion compote in the background. It was a very yummy day! I was quite the domestic diva yesterday. Dad has been telling me for weeks that he wanted more of my spiced blueberry jam but I have not been motivated to make it for him. Seeing as it was Father's Day, it seemed only right to just make my papa some jam. Sort of the least I could do seeing as how my gift that I ordered a month ago is back-ordered (Dad could care less mind you, but I am annoyed to no end). I actually made two different kinds. The normal spiced blueberry (I add cinnamon, cloves and ginger) and then a batch that I made up on the fly (this is where things usually go really really wrong for me in the jam department, my friends!). I made a blueberry banana jam. Let me just tell you, it's really really good! Or it's really really good as long as you like both blueberries and bananas, I guess. I could not believe that both turned out OK. I have the worst luck getting things to jell properly. I can follow directions to the T and not have them jell. And then I go and completely make up a recipe like Blueberry Banana jam and it works out great. Go figure! Also, let me just add this to the list of what to do with the black frozen bananas in my freezer door waiting to be used. Check! So may I let y'all in on a little quirk about myself? 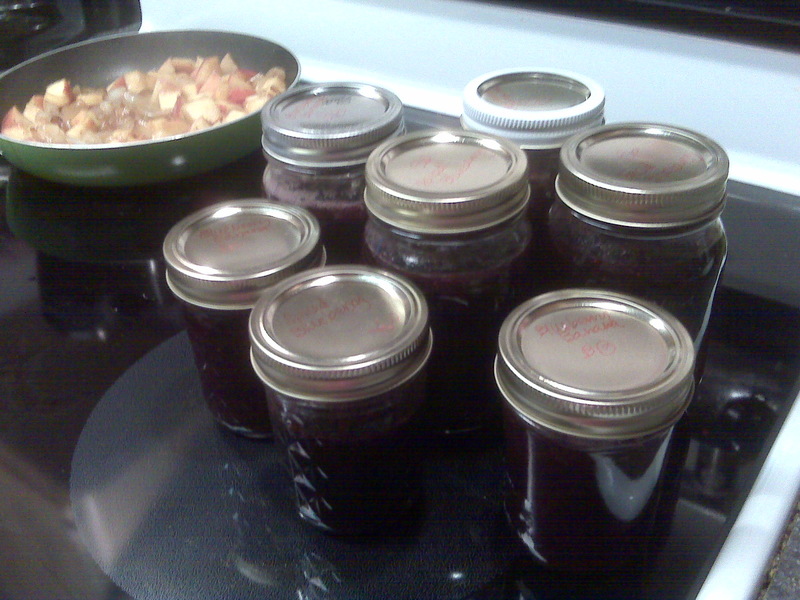 I love making jams and kitchen goodies but I don't actually consume many of them. I just don't eat a lot of jam. About twice a year I have a peanut butter and jelly sandwich. And I sometimes eat it on Greek yogurt or oatmeal. But that's about it. I make it for the sake of making it and then give it away. Strange, I know. I think this photo looks dumb but I wanted to show you the cute little potatoes before I gobbled them up. 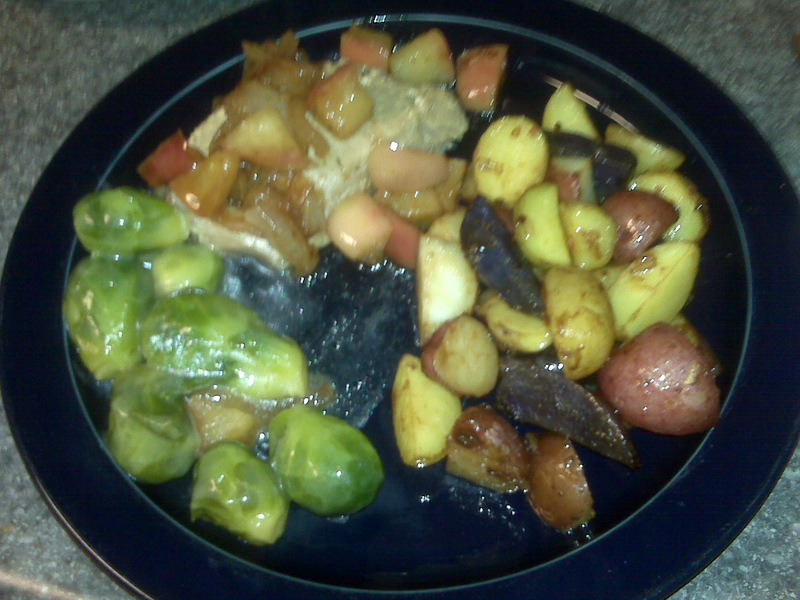 So for my daddy's Father's Day supper, I made pork chops with an apple onion compote-ish topping, brussel sprouts and roasted confetti potatoes. Mmmmm! 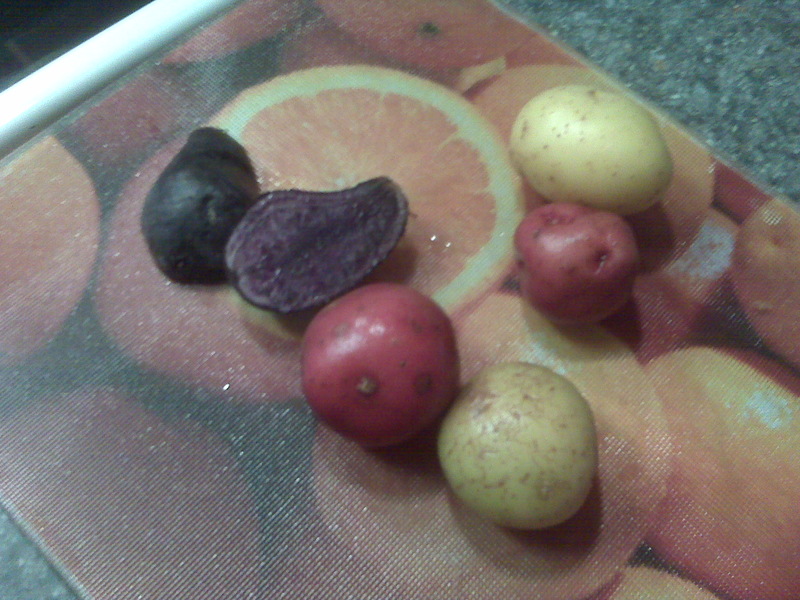 Have y'all ever see the cutie patootie colorful 'taters in the grocery store? Of course the flavor is the same. I mean, for the most part, a potato is generally a potato. But they are just so stunning. I could not get over the purple color. Amazing! I roasted them a family favorite way. Simply tossing in some EVOO and a packet of onion soup mix. Then roast them on a sheet pan until tender. It really couldn't be any easier and the flavor is out of this world. I love them cold the next day too. Ha! You are my very best friend and my forever hero. You drive me crazy and make me laugh and quietly cheer me on in life. You've given up a heck of a lot for me, your little girl. I am so incredibly grateful for all you have done for me. Even though I'm all grown up, you are still here to help and protect me. My furniture would never get moved if it weren't for you. You just never stop being my dad! Thank you for being the most amazing parent in the world! I am a very lucky girl! * Um...is anyone at all surprised that these two didn't get married? I cannot possibly imagine any 20-something wanting to live with an 80-something unless he is her grandfather. The whole situation was had failure written all over it. * So I flipped over to the forbidden fruit (RHNY) for about 10 minutes last night and here's what I learned. Luann is still the snakiest ever. She has, despite her continued claims, no class. She is just rude and condescending and insulting and childish and full of herself and elitist and such a flippin' snob. I turned it off. I am sure they are all still ridiculous. But for whatever reason, it bugs me most that that royal B still thinks she is just the bees knees. She's not. She's gross and a true mean girl! 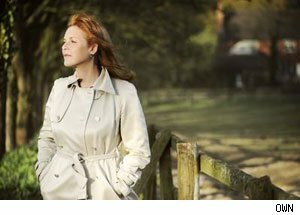 * I think Sarah Ferguson's show aired this week but I forgot to watch. Did anyone else see it? Is it worth watching? It looks sort of boring but I do love any royal tid-bits. * And is anyone else surprised that the OW Network is really just re-runs of Dr. Phil (ew!) and D-list celeb reality shows? Sort of disappointing in my opinion. * So Josh and Anna Duggar had their second child. Anna is only 22. I cannot imagine being so young with two kids and a husband. At 22, I still had a year left in college, was doing normal college/just after college kid things like going out to bars and concerts and the like, and my biggest worry was what to wear to class. In their wedding vows, they promised to have as many children as possible. I mean, I think you should do what you what within the realms of responsibility (read: I do not think 16 year olds should get to keep babies if they cannot properly provide for them. Yup. I said it. And I will say it again. I think there should be minimum standards for being a parent.). And I certainly think that family is wonderful at caring for their children. But I cannot imagine my life without all the experiences I had during my college years. I know college isn't for everyone but it strikes me as so odd that so far, none of those kids have gone on to higher education of some sort. I also think it's ridiculous to name every child with the same first letter. * And it wouldn't be a celeb blog post for me if I didn't throw in my permanent plea to Britney Spears to please please buy a hair brush. And use it. 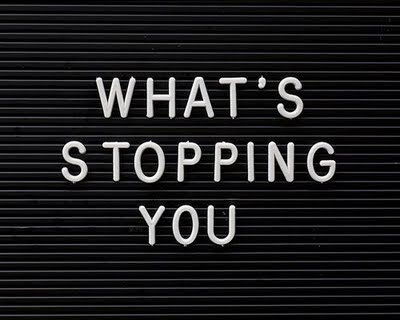 This is my new answer/life mantra to the age ole' complaint/grumble/whine of "I want to do/be/see/have/etc..." The next time I whine that, I am just going to stare at this! Because it's so true girls. 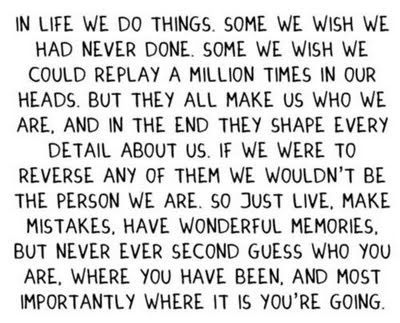 I think we all have those times when we get caught up in the moment or the tiny, silly details. 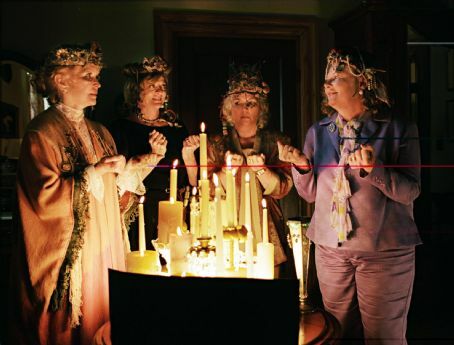 And we forget that, as Glenda says, we had the power all along! So a week and a half ago I was in Hometown, FL to attend my Godsister's wedding. She was stunning and the weekend was fabulous. Every time I am there I wonder why I ever left. I mean, I remember just fine. But my family (who are technically friends but we all have our chosen family in life and they are mine) is just so fun and such a comfort. I miss them! But a certain blonde gentleman wholly and completely stole my heart. My Godson, J! I know I say that every time I see him, but this time was just so different. He's 23 months old now and so much fun! He runs and hops and plays trucks and reads books and knows all his colors and counts and talks non-stop about firetrucks and will do anything for a blue jellybean. Oh he has just the sweetest face and giggle. I am a total giggle whore too. While dancing at the wedding with my main squeeze to Shorty Got Low (a classic for sure! ), he started laughing so hard when I sang (in my very best hip hop while wearing Lilly Pulitzer voice), "low low low low..." So of course I sang it the rest of the weekend non-stop because he would just giggle so big and sing along. I got the biggest kick out of that. I got to hang out with him while the wedding party rehearsed. So naturally we spent our time hopping down the church aisle, pretending to be firefighters (It turns out there were fires all over that church! And our duties included sliding down a pole which looks a little like a less than kosher side job but whatever...he's still darn cute) and counting seats in each pew (there were always nine, no matter how many I foolishly thought there were). He held my hand and gave me hugs all weekend. And the funniest thing (to me anyway) is that he calls me KK. No one in that group calls me by my nickname. But I guess Auntie Fairy Godmother Fullname was too much to ask of the tot. And his sweet sweet voice...oh I hope he calls me that forever because I just melt. When J's momma, Florida, found out that she was having a boy, I was a little understated. I mean, I was overjoyed at her having a baby. We've been best friends since birth. So this was a major event for me too. But I am such a girly girl. I was worried that after the baby boy moved beyond the hold the baby stage of life, I wouldn't know how to play with him. And since I see them so infrequently, he would never connect with me. But I was totally wrong. Little boys are just such a hoot. He is a total spitfire of energy and cuteness. So smart and curious. And still so loving too at this age. I wish I could spend all day, every day with my little prince! I cried after I said my goodbyes that Sunday night and have tried to figure out a way to see him much more often. Missing so many moments truly breaks me heart. Oh, I am just totally and completely in love with that blue-eyed sweet thing!! So my morning started out with phone calls that the squirrel's nest had been broken into. Then by a zillion more calls and notes on the matter. Then a visit to see the damage. Which wasn't much other than the expense of re-securing the house- which is quite an expense for a non-profit group. Not to mention a pain in my squirrel tail! Then dealing with the blog issues I've had going on for half a week now. And have been driving me insane. Literally. I was just at the end of my rope. Then a visit to the vet (our regular 2 month visit) for glands and nails. Where I could hear my fur baby crying all the way down the hall. Poor thing. She starts trembling as soon as we pass a certain point in the car as she recognizes the road to the vet's office. Then home for a bubble bath because she stinks to the high heavens after leaving the vet. Between the process and the junk they use to clean her tush, oy! Gag me. Giving an unwilling dog a bath is even less fun than visiting the vet, y'all! It's a rather dreadful process for all involved. We are both sopping wet in the end and both super grumpy. But...there is a silver lining. Or perhaps a pleasant shade of gray. The nest is going to be OK, albeit a pain in my fanny for the rest of the summer. The vet and bath are finished for the next two months. AND...my blog issues have been resolved. Now I am not entirely sure why they have resolved themselves. But right now I am too mentally exhausted to figure it all out. 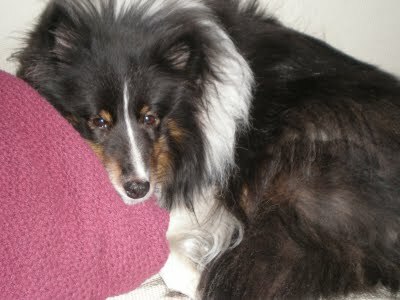 'Puters are just not my thing and I am grateful for some very kind strangers for so generously helping me. So tonight I will make some homemade gluten free pasta and call it a day. Tomorrow is bound to be better. I hope! Yes, you read that correctly. Sweet potatoes. In a salad. With bacon. Because it makes all things better. I'm rocking pot-luck picnics everywhere, my friends. Gettin' down with my crazy salad self! This was an original creation that totally had the potential to be a disaster. 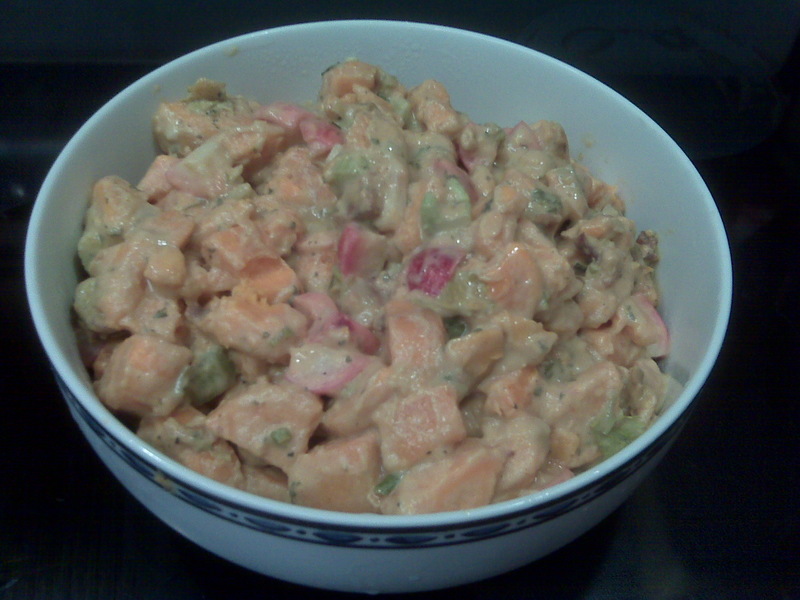 I saw Rachel Ray make a potato salad with a honey Dijon mustard dressing the other day and liked that idea. Then when googling recipes, I saw one for a hot potato salad that involved beef broth and bacon. I stopped reading after bacon. I knew that had to be involved. And well, if you've been reading long enough, you must realize that I love a sweet potato the way Paula Dean loves a stick of butter. So the creation was born in my head, translated in a bowl and resulted in total fabulousness. This is a MUST try. Not a "you might want to taste it" but a "you MUST MUST MUST make this today" recipe! Oh and I made this for a large crowd as we celebrated Flag Day. If you are just feeding 4 or 5, I'd cut it in half. But like all of my recipes, I write nothing down and just eyeball it. I know this must be so annoying for type A's out there (ahem, Bestie). But just use your best judgement. It is, after all, just a salad. * Cook potatoes until just tender. Don't overcook or you'll instead have a mashed potato salad. * Whisk dressing ingredients together while potatoes are cooking. Be sure to adjust to taste. * Toss veggies into dressing as they finish getting chopped. * When potatoes are finished cooking, drain and then return them to the hot pot to dry off for a moment. Then toss the hot potatoes into the dressing. 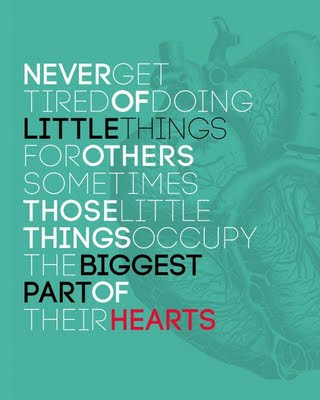 Gently toss together. Chill in the fridge over night or at least a few hours to let the flavors blend together. 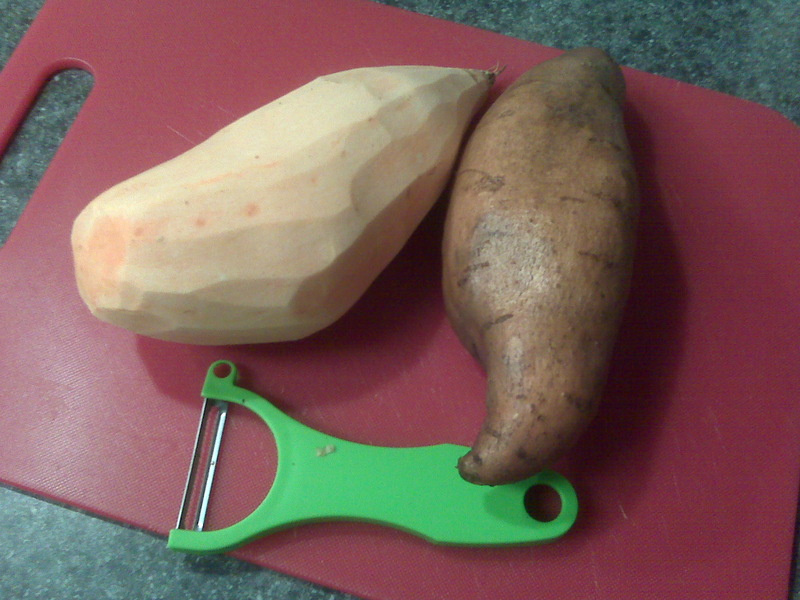 And this was taken the NEXT day when I realized the only photo I had was of a dumb peel potato! OK so seriously...you must make this. It's so different and tasty. Sweet and savory all at the same time. So how many of y'all knew that Flag Day was a holiday? Me neither, until I moved to New England. In my corner of the country, it's totally a big deal. Parades all weekend actually. 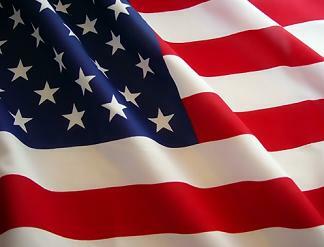 We wave the red, white and blue proudly in these parts! At least...we do on Flag Day anyway. I read this on another blog but wrote it down on paper. But at first I didn't think it worked so I got off that blog. I didn't realize until yesterday I needed to re-log into blogger. So my point is that I can't give credit to the nice blogger who figured this out. * Look up- click "Tools"
* Then click "Internet Options"
After this, I had to sign out and then sign back in again. But eventually, I was able to comment again on blogs that have word verification. Only making me more bitter about y'alls ridiculously complicated word verification insistence. Just saying this is an awfully big hoop to jump through! But for me it worked. So to that kind blogger whom I stumbled upon the other night...thank you! At what point did we start using cell phones exclusively (or um...at all...) for taking nudie photos of ourselves? Like when did that become a "thing?" And who on earth is dumb enough to believe that those nekkid pictures won't come back to bit you in your bare bum big time? Did we learn nothing from Paris Hilton, my fellow Americans? She isn't good for much. But she has certainly done her job as a leader in the fine art of what not to do in life. And this nakid photo business is so Paris 10 years ago. It's been done. And mocked until utter humiliation. For more than a decade, my general life motto has been "if your life begins to look life a Lifetime made for TV movie, it's time to change your life." But I think another good general life motto for every person who has ever seen a cell phone, digital camera, non-digital camera, computer, mall photo booth, bank security camera, or door intercom should be "if Paris has done it, you just shouldn't do it. Ever." It's not just celebs and politicians in hot water. Last night on my local news a police chief a few cities north of me got himself into the same clothing-less cell phone scandal. I mean, what the heck? Just keep your clothes on people. Have you ever seen a cell phone photo anyway? They never look good. While I've never seen a nekkie cell pic, I have to assume it's not doing your dirty bird self any justice. OMG 9000 posts in one day! I'm out of control and promise to keep quiet this weekend. I just seem to have a lot to say today. Including telling you about a coupon you need to print out for FREE Lipton Iced Tea. I've never tried it, but I've also never met a glass of iced tea I didn't love. So I'm sure it will be a tasty treat. And I mean, it's FREE. So I can learn to live with a lot of things when it comes to me gratis. 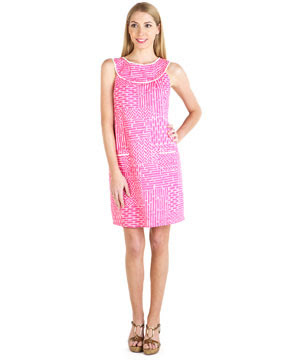 So after a few misses lately on Ruelala, I had a sweet little success today. I was logged in 45 mins in advance and registered my credit card in advance too. I stalked that thing like a crazy lady! So there were several dresses I liked, including the strawberry print shift. I LOVE LOVE that fabric. But I have so many classic shift dresses and am trying hard to refrain from buying any more for a while. Trying to branch out. So I removed it from my cart. I do really love that print though! I had this one in my cart too because I love a maxi dress on myself. And I love the color. But I am not as in love with the print. Not head to toe in love anyway. So out it came. In the end, this was my only purchase. Very responsible of me, no? I love that it's not a floral- something different (it's bamboo in case you can't tell from the photo). And pink. Pink clothes just make me smile. And short. My legs are my good feature. No need to deny the world a glance of my hot gams! Ha. So did anyone else have success on Rue or all of y'all in PA at the sale and laughing at my mini preppy victory? I'm still bitter about not getting that patch skirt last time (ahem...Carolyn!). Is anyone else following this case? I don't sit and watch the updates every day but have certainly paid attention since the beginning. Which is unusual for me- I don't typically pay attention to court cases. For whatever reason though, this bizarre situation has just captured my attention. Everything about it dumbfounds me. Waiting more than a month to tell anyone about your missing daughter. I mean, even if you killed her, you had to know that someone would eventually notice, right? The stone cold face. The only time you ever see her get emotional is when she is yelling at her parents for not paying attention to her. The grandparents. I can't imagine being in their shoes. They are worried about the little girl. Confused and worried about their daughter. Unable to deal with the reality (who could ever deal with that horror?). Followed by the media and blamed for everything. I know people think they are strange birds. 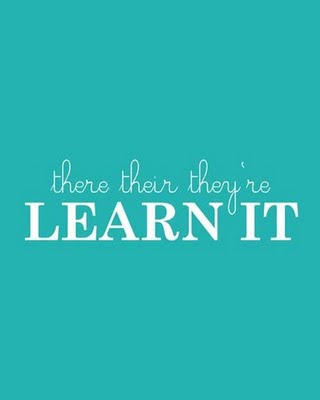 Maybe they are. But I can't fathom how strange I might act in their shoes. The "experts" on HLN (or as I refer to it, CNN's dumb ugly step child). Like the guy who is always always in the exact same black shirt, black vest and black cowboy hat. The 84 computer searched for chloroform. I mean, we all google random stuff now and then but 84 similar searches is no accident. But what fascinates me the most lately is the claim that the Caylee drown and the grandfather helped Casey cover it up. When did it go from "Zany the nanny" to "I knew about the accident all along?" And how could you bring your father into your mess too? And why are the parents still standing by her, after her abuse claims? I think she is just a flat out psychopath. A truly scary person in a sweet, cute girl's body. Oh and can you even imagine getting called for jury duty only to find out this is your assigned case? Talk about a weight of responsibility! OK so I still cannot comment on blogs that have word verification. Is everyone having this issue or just me? Blogger takes at least six months to answer my questions and I am not sure how to fix this glitch. It's annoying and I feel all sorts of guilty about the matter. Also, I've mentioned in passing several times over the last month to people that I've never tasted an Oreo cookie. And every single person seems to find this shocking. I never really thought about it. I mean, I've lived 30+ years without tasting one. It's never been an issue in my life. But is it really odd? In case you're wondering, I have not tasted an Oreo because I can't get beyond the smell. Ugh...they make my stomach curl. They just smell so gross and I see no need to see what they taste like. Ditto on candy corn, but I've mentioned that on here already. And finally, I just found Fried Green Tomatoes on TV. Perfect way to end my day! It's just one of my all time favorite movies. Tawanda! My Godsister, Emily, asked me to make her bridesmaid gifts and she sent me links to cute bags that I've never made. Both fun and daunting. I am not sure if this is what she had in mind. Now that I reflect, she actually might have intended for them to be smaller. But I was trying to think of all the necessities that a girl needs for her bridesmaiding (Yes, in my world, it is in fact a verb.) duties. I am your resident bridesmaiding expert, afterall. In the end, I made myself one too. I have to say, I love it. The size is great to fit all the important items and then some. 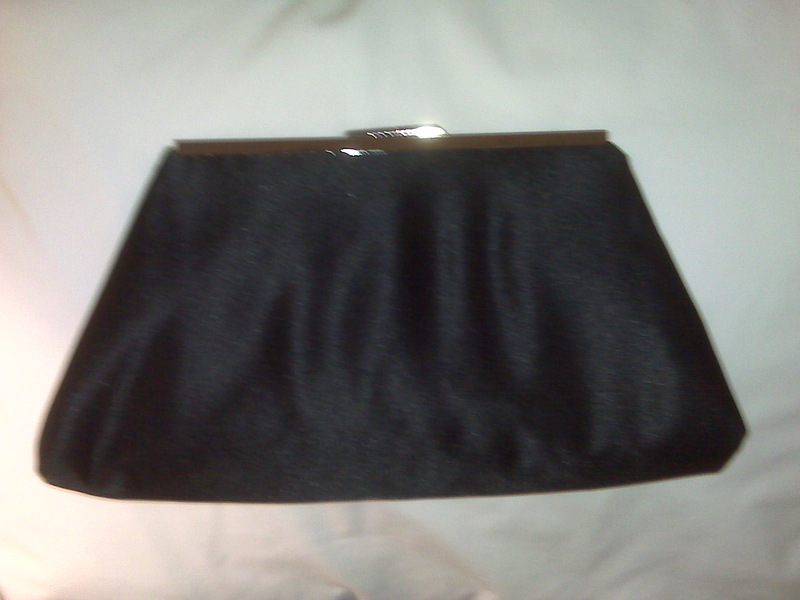 But sleek enough to not scream "giant handbag." A fine line, my friends. I think Em liked them. Though, she saw the for the first time as her bridesmaids opened them and I was in the same room so what was she going to say really? Anyway, I wanted to take some great photos of the bags before I left. But then I forgot about that plan. Typical. 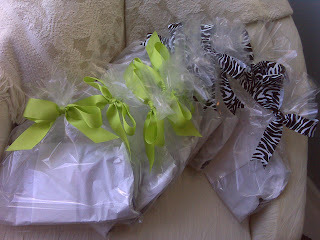 So as I was wrapping them at 11PM the night before the bridesmaid's luncheon, I threw a few of them on the bed and took some crappy pics with my blackberry. So in review, these were taken when I was way over-tired, at night, on a bed, in a room with bad photography lighting and on a blackberry. Qual-i-ty! There were two different insides. 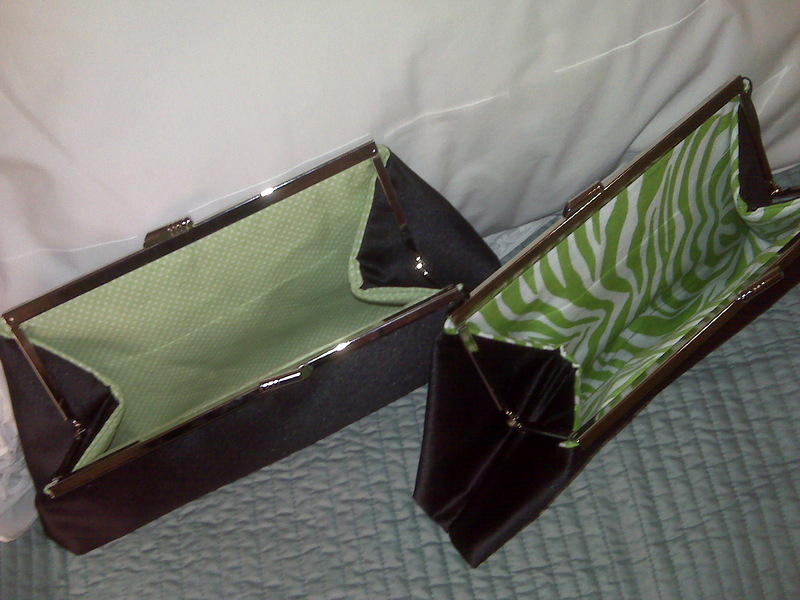 I'm not sure how clear it is on the fantastic photos but one is green with tiny white polka dots and the other is a bit sassier with green and white zebra stripes. I love them both but the bolder zebra print is my favorite. 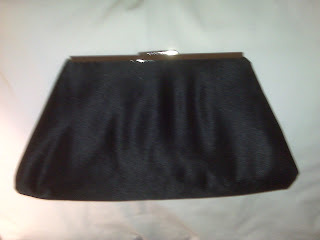 The Emily Clutch is surely going to become my new favorite bag that I make. I just love the outcome! Did you know that MTV gave out awards for who knows what the other night? Me neither. But this bit is floating about the internet and of course I had to share. I can't even imagine what Reese won at a music awards show but maybe they hand out awards to anyone disease free these days? Who knows what the kids are into now?! But once again, she proves herself to be as fabulous as all get out. Classy with a capital C and a true voice of reason. She is forever cool in my book! Y'all are fabulous. Worrying that I jumped off a bridge or something. I'm alive and well. I was just crazy busy last week and then was out of town from Wednesday - late Monday at a wedding in my hometown. It was a truly fabulous weekend. With a stunning bride. And more belly laughs than I have had all year. Good times were had by all! Thank you for checking in on me. I'm great. But was in Florida drinking Mimis and loving on my Godson. I will be back shortly - maybe even this evening- with photos of some cute bags that I recently made for the wedding. I love the blog, Bits of Truth. She finds the best quotes and graphics and puts them all together for us to enjoy. Fabulous!